HIKE PREREQUISITE: Must have completed at least a Level 5 or 6 LATH hike with no problem. Adventure Pass required to park. CARPOOL: Parking is very limited at the trailhead, as with other popular Angeles National Forest areas, so we highly urge carpooling prior to getting to the meeting point. We’ll try to consolidate cars just before we leave the meeting point, but we need all attending hikers to make an effort in keeping the number of vehicles to a minimum. TRAIL WALKTHROUGH: This hike about 10 miles round-trip so take enough water and snacks (trail mix, fruits etc.) with an elevation of 950-1400 ft. We will cross the river a total of 12 times and the river can be about 3 1/2 ft deep (slightly lower during drier seasons) and about 20ft wide, running fast and cold. There will be plenty of bolder hoping if the water is not to high. There wil be one technical area where you may need to slightly step down a small rock wall area, about 5-6 ft. Along the way, we will get to see the Swan Rock formation. The trail we follow throughout the hike is sun-exposed, so make sure you wear a good hat and sunscreen. 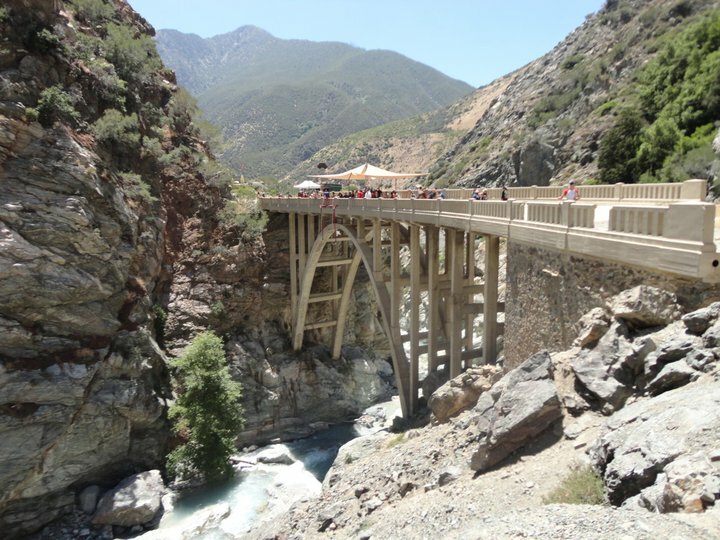 Our goal will be the Bridge to Nowhere, which was built in 1930 as a potential connector between the San Gabriel Valley and Wrightwood. Once we get to the other side of the bridge, there will be a narrow crossing that will then take us down below. Here, we’ll take our primary break and enjoy some time in the lower area of the river area after crossing the bridge. Most hikers tend to enjoy some time in the river at this point, and we’ll have plenty of time for this. We’ll return along the same trail route all the way back to the parking lot. WATER REQUIRED. WATER CHECK WILL BE PERFORMED. If you do not take enough water or are not appropriately equipped for this hike, you will be turned away from doing this hike with us even if you show up. Please note, that we have expectations for Level 7 hikers. REQUIRED: At least 3-4 liters of water (and any additional water you can carry) as most people run out along the way. IF YOU DO NOT HAVE ENOUGH WATER, YOU WILL NOT BE ALLOWED TO DO THE HIKE WITH US. If you can, bring electrolytes as part of one of your water sources or as tablets to add to one of your water bottles. Sungear: A hat/cap to protect your head from the sun, sunscreen, (comfortable) light colored and lightweight, fast drying clothes. Absolutely no jeans. A good sized lunch (at the turn back point) and small snacks (while on the trail). Water/River footwear if you do not plan on getting your hiking shoes wet. 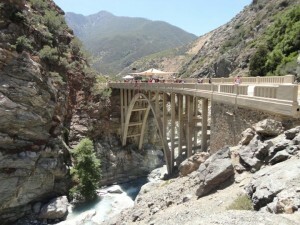 The Bridge to Nowhere hike requires appropriate footwear, gear, nutrition and water preparation. If you’re not sure what this means, please make sure you ask us on hikes leading up this one and make sure you understand the requirements for this hike. Hiking pants/shorts are light-weight, keep you cool, and dry quick (if wet). River sandals (known to some as water socks, but they are not socks) which have straps that will wrap around your ankles. No beach sandals, which can easily slide off your feet (plus are not intended for hiking). No flat soled shoes like Vans, Converse or other non-hiking footwear. Hiking shoes that may be waterproof. There’s a good chance you can cross the, currently low, river crossings without getting wet by using the rocks that stick out of the water. Do not wear jeans, they are heavy (especially if wet) and insulate heat. (Wool/Bamboo) Hiking socks are helpful in keeping your feet cool and comfortable while hiking footwear. You may want to keep an extra pair of socks to wear after any water play. Take snacks to have along the way and at the turn back point. Pack fruits such as oranges, apples, peaches, and bananas. These tend to be juicy and will keep you cool too. Pack some nuts or trail mix. In the past, hikers may have also taken hard-boiled eggs (halved-whites), hummus, Peanut Butter & Jelly Sandwiches, dried fruit, granola mixes, berries, string cheese, and small cut veggies (carrots, celery) in small baggies or containers. If your knee or ankles act up on bigger hikers, you may want to bring a knee or ankle brace just in case. Some hikers claim that this trail does cause such impact even though it there isn’t a big elevation gain on the rolling hill trail. Prevent inner thigh leg chafing. Some people may apply vaseline, others may use baby powder. Make sure you know this may happen as your legs rub against each other because of distance, or simply because they get wet causing a bad friction in the area. Some hikers forget this. Blisters on feet can sometimes be an issue because of distance. Make sure that you carry some cloth tape or cloth band-aids/bandages that you can apply should they start to develop. RECOMMENDED: Tough/Sport shoes (bring an extra change of shoes and clothes for the way back home), backpack or camelpak, a towel, and a water pump/filter if you have one. Keep important items dry by storing them in ziplock bags. Carb up and keep hydrated the night before. Wear light-colored clothing to keep cool in hot, sun-exposed areas (there will be plenty). DOG-FRIENDLY? : No. Although allowed by the Park, we would rather not have dogs come along on this level/heat intensive hike with the group on this hike. SPECIAL NOTE: There is a restroom on the parking lot to change after the Hike. You will get your shoes wet so be ready to hike with wet shoes and be ready to have fun! PLEASE MAKE SURE YOU BRING A BAG/CAMELBAK/ETC to put your carry items, you will need to keep your hands free for safety! HEAT WILL BE A FACTOR FOR THIS HIKE, PLEASE KEEP THIS IN MIND.